Autumn is traditionally the hunting season and many hunters are already their preparing rifles and shotguns. However, in order to avoid unnecessary risks it is always necessary to handle weapons with maximum safety. One particularly sensitive issue is that of storing the guns when they are not being used. It is therefore necessary to prevent them from falling into the hands of criminals or even simply individuals who are unable to handle them safely, such as children. The Viro “Diario di caccia” gun cabinet enables hunters to sleep soundly because it is built in order to offer the highest levels of safety, so that the guns are used only by authorised individuals. The Viro “Diario di caccia” is equipped with an advanced electronic combination lock which completely eliminates the need to find a safe hiding place for the key and avoids the risk of losing the key or have it stolen. 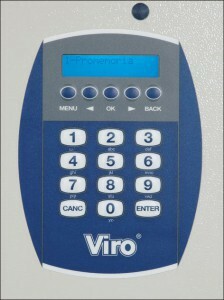 Control panel of the Viro “Diario di caccia” gun cabinet with an electronic combination lock. The presence of electronics is a safety factor, but also a convenience. It provides numerous advanced features and the audit trail of the last 50 operations performed. The effectiveness of the Viro “Diario di caccia” gun cabinet compared with other cabinets is the result of many factors, some of which are hidden.Many low cost electronic cabinets have, for example, a weak point in the display or the keyboard, with the risk that the inside is tampered with using burglary tools. 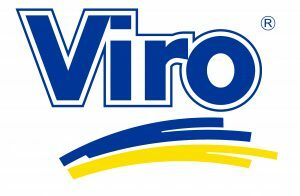 However, the display of the Viro “Diario di caccia” has a rear protection against breakage, precisely to prevent such attacks. Another possible weakness of cabinets with electronic locks is the electromagnet which controls the opening: if one manages to pierce the door at an electromagnet without protection, it is possible to trip it and open the cabinet. For this reason, the electromagnet of the Viro cabinet is protected by a special steel plate. Even the electronic board has been carefully designed to protect it against tampering with high-voltage discharges and against damage that could result from inadvertent reversal of the polarity of the batteries. Lastly, the cabinet is equipped with a non-volatile memory, so that, even without batteries or with flat batteries, neither the opening codes nor the stored data are lost. In addition to the high quality electronics, a feature which distinguishes the Viro “Diario di caccia” from many other gun cabinets is the fact that all internal components are made entirely of steel, without plastic parts, to ensure strength and durability over time. The case is made of 5 mm thick steel and the rear wall is provided with holes for anchoring to the wall, just like safes. The door, which is 3 mm thick, is made of steel and abuts on 3 sides to effectively combat attempts to break through. The hinge side, which is one of the most frequently attacked points, is protected against pulling off. The hinges are made of steel and have a diameter of 14mm with 7 mm pins, again made of steel. The lock controls 4 cut-resistant rotary steel bolts, 2 horizontal and 2 vertical, to resist the breaking and pulling off of the door. 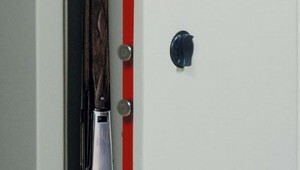 The construction quality of the Viro cabinet is also evident from many other small details, such as the knob coated with non-slip ABS, but with a steel core, made with a programmed breakage point, so that if someone tries to force the knob it breaks at a precise point, leaving no handholds or holes which can be attacked with burglary tools. There is also the emergency lock, which is protected by a special drill-resistant plate. Detail of the two horizontal bolts and the knob. Since the use of guns must only be for enjoyment, the advice is to store them in a proper security cabinet, with as many additional services and protection devices as possible, as is the case with the Viro “Diario di caccia”. This reduces to a minimum the risk that the guns fall into the wrong hands. This entry was posted in Safety cabinets and tagged products, security, technology on 14 September 2015 by Mara Rossi.